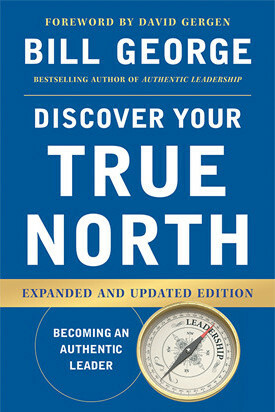 Discover Your True North and The Discover Your True North Fieldbook are available for purchase at the online retailers below. Find out how uncovering the answer to this question can guide you toward greater success in Discover Your True North, an instant leadership classic by bestselling author and Harvard Business School Senior Fellow Bill George. In this book and its companion workbook, The Discover Your True North Fieldbook, you’ll take a journey toward your own True North, the internal compass that sets you on a path toward your fullest potential as a leader and as a person. Along the way you’ll encounter poignant, first-hand stories of leaders like Indra Nooyi, Arianna Huffington, Warren Buffet, and Mark Zuckerberg. They have each mined their most challenging experiences to find and follow their own True North … and so can you. Today’s global business community calls out for leaders who will change the world for the better and inspire others around them to do the same. In Discover Your True North, you’ll learn how you can answer that call.